Last year, Joey took me to one of our favorite restaurants for my birthday. I had a seared pork loin that was stuffed with cheese and prosciutto and coated in a porcini mushroom crust. It was insanely delicious, and I vowed to recreate it then and there. And here we are, almost one year later.... Somehow a mushroom-crusted pork loin morphed into the idea of a mushroom-crusted turkey burger. It was definitely a great adaptation. To coat the burgers, I ground up some dried porcini mushrooms in the food processor (I used my mini-prep for the job), and then coated the burgers with the powder. I kept the burger itself pretty simple - a few simple herbs and spices and a little bit of the porcini powder. Seared in a skillet and topped with Havarti and a little arugula, these burgers now top the list as on of our favorite meals. I love making fun burgers, and Joey said these are probably his favorite that I've made yet. The mushroom crust gets a little crispy in the skillet, and the earthy mushrooms go really well with the turkey burgers and creamy Havarti. The arugula gives the whole thing a bit of freshness and bite. Ready in under 30 minutes, full of mushroom flavor, and relatively healthy - what more could you want? In the bowl of a food processor, grind the dried mushrooms until they are a coarse powder. Reserve 2 teaspoons of the powder, and transfer the rest to a shallow bowl or pie plate and mix in the salt and pepper. In a large bowl, combine the turkey, reserved mushroom powder, scallion, parsley, mustard, and worcestershire sauce. Season with salt and pepper to taste. Form into 4 equal-sized patties. Preheat a large skillet over medium heat, and add the oil. Working one burger at a time, coat the outside with the mushroom powder, pressing lightly to adhere. Cook the burgers 4-5 minuts per side, or until the meat is cooked through. Add the cheese for the last minute or two, and continue cooking until it has melted. Toast the buns and serve the burgers topped with arugula. Oh, yum! 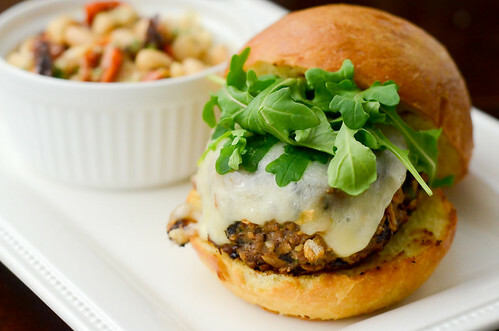 We love mushrooms and this sounds like such a creative way to use them with your burger. I have to admit that I'm not a huge turkey burger fan, but this one looks really awesome. It's probably only the second turkey burger recipe I've ever starred. :) Looking forward to making it soon! This looks amazing. I love mushrooms, but my boyfriend can't stand their texture...I'm thinking these would be a good way to sneak them into his food without him realizing since they're ground up! LOVE turkey burgers and I'm always looking for a way to spruce them up a bit. This sounds so gourmet and delicious! Wow, that's one juicy looking burger and sound so gourmet. Yum! I'm usually not one for turkey burgers, but this sounds amazing. I'm thinking the flavor of the mushrooms almost gives it a beefy quality? Will try these for sure! okay, seriously - mushroom crusted burgers today and Arugula salad yesterday?? GIRL... we are SO on the same food wavelength this week ;) These burgers look amazing! Can't wait to try them! What an interesting idea...I wonder if this would help to spruce up a bean burger also and add some crunch and texture to it! What a great idea! Mushrooms are actually one thing that are easy to find in China, now all I need to do is find ground turkey. Though I might have better luck finding ground pork... Hmm wheels a-turning here! Hi Josie! You did a great job organizing the shower and the mushrooms look incredible! I can't wait to try them. I love stuffed mushrooms and the brie and crab filling sounds like it would be amazing! these sound so, so wonderful! I love anything mushroom so I have no doubt I'll go crazy for these! awesome use of the dried mushrooms! I've heard of chefs doing some pretty awesome things with powdered dried fruits and veggies, and this is definitely up there :) Makes me ponder what else could be done! These look great. I love recreating meals at home. I'm bookmarking these to make soon. Josie, wanted you to know that I made these just a few nights ago (and blogged abt them tonight) and they were a big hit! Thanks for a great recipe! Made these tonight for dinner. They were great. My husband gags at the texture of a mushroom but the flavor from the mushroom powder wasnt offensive! Glad you liked them, B! It's a sad life to lead if you hate mushrooms! !